This book brings together four homilies of St. Josemaria Escriva, the founder of Opus Dei. 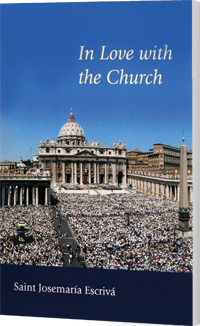 These homilies contain magnificent reflections on the Church and the laity's role in the Church, written in St. Josemaria's attractive and compelling style. It offers an opportunity to grow in love for the Church and to learn how to serve her more faithfully, guided by a saint whose own love for the Church was truly remarkable.